Scare stories in the media about SARS, West Nile Fever, the Ebola virus and Bird flu have fallen flat. So far, each of these potential threats have come to naught. Only a handful of people – generally people who handled infected animals or birds, or people with other health problems – have died from any of these infections. But what if the next scary prediction comes true? Then we really will be in deep trouble. That’s the background to Stephen Soderbergh’s Contagion. Starting on Day 2 of the virus outbreak we see a clearly ill Gwyneth Paltrow (as Beth Emhoff) atChicago airport as she travels home toMinneapolis from a business trip inHong Kong. Just like the TV ad on food poisoning, we see the virus spread as Beth dips into a bowl of nuts at the airport, as she hands over her credit card from the barman’s hand, to the till, to the glass on the bar. She spreads the virus to her husband Mitch (Matt Damon) and her young son as well as most people she came in contact with on the way home. Mitch is somehow immune. The youngster dies. Other folk who were in her company spread the virus in Kowloon (Hong Kong), London (population 8.6 million) and Guandong province (population 98 million) starting off a chain of events in which millions fall ill and die. In this exciting race against time Dr Ellis Cheever (Laurence Fishburne) of the Centre for Disease Control sends his Epidemic Intelligence officer, Dr Erin Mears (Kate Winslet) to find out how the virus started. Meanwhile, Dr. Leonora Orantes (Marion Cotillard) of the World Health Organisation flies toChina– where she gets a big deal of trouble with the angry locals. As the days mount up an Australian conspiracy blogger Alan Krumwiede (Jude Law) causes worldwide panic with outlandish theories and quack ‘cures’. The CDC races against time to come up with a vaccination against the MEV-1 virus in the face of universal criticism led by Krumwiede. Soderbergh’s movie also looks at the human scale of the virus’ effects on individuals; Damon’s widowed Mitch Emhoff and his daughter, as well as the personal side of Fishburne’s Dr Cheever and his wife Aubrey (Sanaa Lathan). 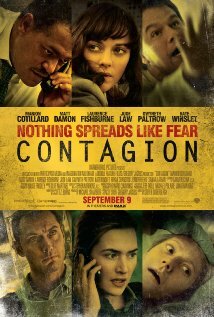 A strong cast and a compelling storyline make Contagion well worth seeing. It shows how helpless we are in the face of such natural disasters. It will make you think. How many times a day do you touch your face? Are you sure you want to shake hands?